1 Crack the eggs into a medium mixing bowl, add cream, salt and pepper. Whisk until eggs and cream are well combined. 2 Melt butter in a non-stick frying pan over medium heat. Add sausage and cook until lightly brown. Add tomatoes and egg mixture. Gently push the egg mixture, scraping the top of the spoon along the base of the pan, from one side of the pan to the other, until just set. 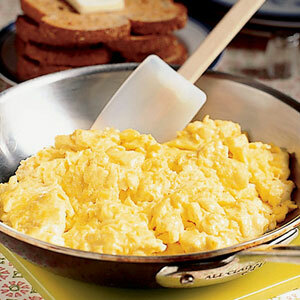 4 Divide eggs among two plates, top each with a toast, scatter over parmesan cheese and serve immediately.